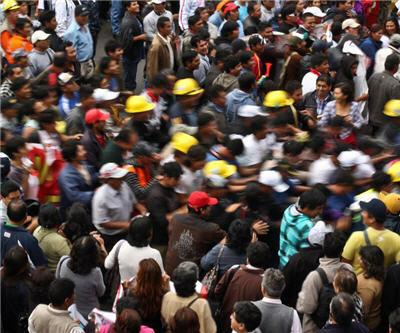 After almost a year of non-stop anti-mining protests in different regions of Peru, the country’s mining, oil and energy society (SNMPE) says investors have started looking for greener pastures and so mining investment in the South American nation is expected to fall 33% next year. Instead of the lauded $6 billion in mining invested forecasted for 2013 earlier this year, SNMPE says the country’s sector will attract about $4 billion, according to the head of the mining committee at SNMPE, Eva Arias, as quoted by the state news agency Andina (in Spanish). Earlier this week, local newspaper Gestion reported that 15 large-scale and mid-size mining projects with a total investment of $17 billion were delayed between December 2011 and July of this year. The numbers do not consider Conga that, if included, would take the total up to $21.8 billion, according to the article (in Spanish only). The projects include US-based Southern Copper's (NYSE: SCCO) Toquepala copper mine expansion in Tacna region, local miner Minsur's Mina Justa copper project at the Marcona property in Ica, Chinese company Nanjinzhao's Pampa del Pongo iron ore project in Arequipa and Toronto-based Sulliden Gold's (TSX: SUE) Shahuindo project in Cajamarca. At least six of those 15 projects were scheduled to fire up operations this year, with the rest expected to start between 2013 and 2015. The majority have postponed the start dates by one or two years, according to the newspaper. In response to the press reports, mines and energy minister Jorge Merino said the government has already approved $28 billion worth in project, which environmental impact studies (EISs) are underway. The authority noted that the alleged delays reported in the media were related to "projects that have not completed exploration and that do not have an EIS," he told La Republica. Peru is the world's second biggest producer of copper and silver and a major producer of gold, zinc, lead and other minerals. The country’s extractive sector, which accounts for some 60% of the economy, is expected to bring $50 billion to the local economy in future investment over the next decade.